A super-power I'd frankly rather not have. Or smell. I'm all froze up -- do I go for the (doubtlessly rocky and gritty) oral pleasure innuendo of the first thought balloon? The implicit fart joke of the second? The look of shock and horror on Ben Grimm's face at his apparently complete lack of control over his own bodily functions? Or the fact that when you've been turned into an ambulatory pile of orange rocks by cosmic rays, your gaseous emissions go "Rrrrooosh! ", which frankly I did not know, despite a college-level geology course? But in honor of OnomontoPOWia Friday, I will go with the last joke. Plus, it's educational. I just wish we had a complete compilation of all the sounds your various heroes make when passing gas, each with its own evocative name like Ben's given us here with his "Screamin' Wind". I bet Superman's could blow down a building if he's not careful ("Smellier than a foetid swamp! More noxious than a landfill!" "Look, up in the sky! It's a cloud! It's nuclear fallout! No, it's ... OH MY GOD!!!). Iron Man doubtlessly has some sort of self-contained air filtration unit; if not, talk about repulsor beams! I bet the Scarlet Witch's arrive with a bewildering array of hex-powered unfortunate consequences ("Wanda, my Perrier seems to have transmogrified into biodiesel again, could you please lay off the garlic?"). And they don't call Thor "The God of Thunder" for nothing, I'm telling you. And yes, I just spent a whole paragraph speculating on the flatulence of super-powered individuals, marking an all-new nadir for this blog. Wahoo! 4 Responses to A super-power I'd frankly rather not have. Or smell. Outstanding post, Jeffrey. “God of Thunder,” indeed! You could’ve actually fit in all the juvenile jokes. The relaxation of the first could lead to the emission of the second, resulting in the horror of the third, causing one to “look away” by pondering the fourth. So, I admire your restraint! 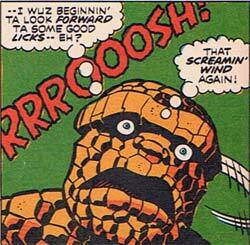 He’s shocked by his own ‘sceaming wind’ because he’s made out of rock. He can’t feel it coming out. And I suppose if you heard someone as big and powerful as Ben pass gas, you’d be a little spooked by the sound too.